Taiwan's latitude and longitude is 25° 03'N and 121° 30'W . Below is the map of Taiwan showing major towns, roads, airports with latitudes and longitudes plotted on it. Taiwan is an island nation on the Pacific Ocean, having geographic coordinates of 25°03'N latitude and 121°30'W longitude . 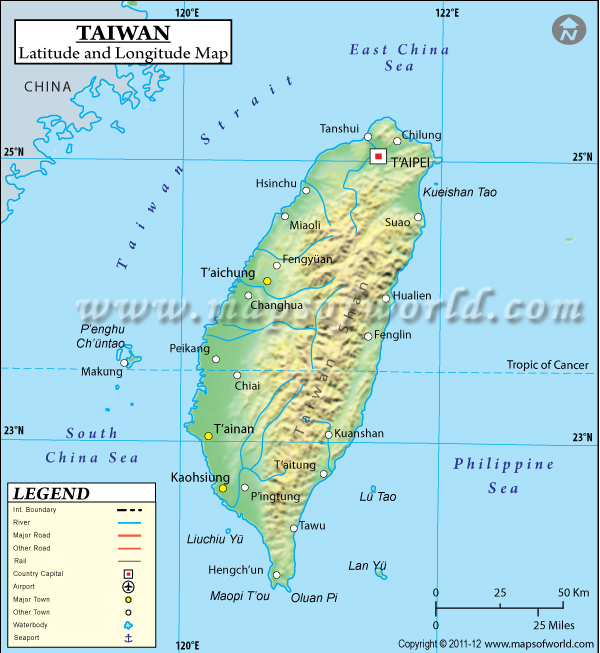 Taiwan is an East Asian country, lying across the ocean from Mainland China. Taiwan is surrounded by the East China Sea in the North, the Philippine Sea to the East, the Luzon Strait in the South and the South China Sea to the West. The geographic coordinates of the Taiwan Islands spans across an area of 35,980 sq km. The capital of Taiwan is Taipei, the geographic latitude and longitude is 25°02'N and 121°38'W respectively. Taiwan was originally a Chinese territory which was taken over by the Japanese in 1895° However the Japanese ceded Taiwan to the Chinese again after World War II. The latitude and longitude of Taiwan has an impact on both its climate and terrain. The climate is tropical marine; the humidity and precipitation are intense during June to August. The terrain is rugged and mountainous.